Lithuanian marketing professional Lukas Yla arrived in San Francisco this summer with a sweet plan to make a name for himself in what may well be the world's most oversaturated job market. Yla was able to get his literal foot in the door at 10 of the Bay Area's top ad agencies and 30 tech companies without hyping a new app or a viral campaign or even a portfolio. He did it with one not-so-weird trick—free donuts. 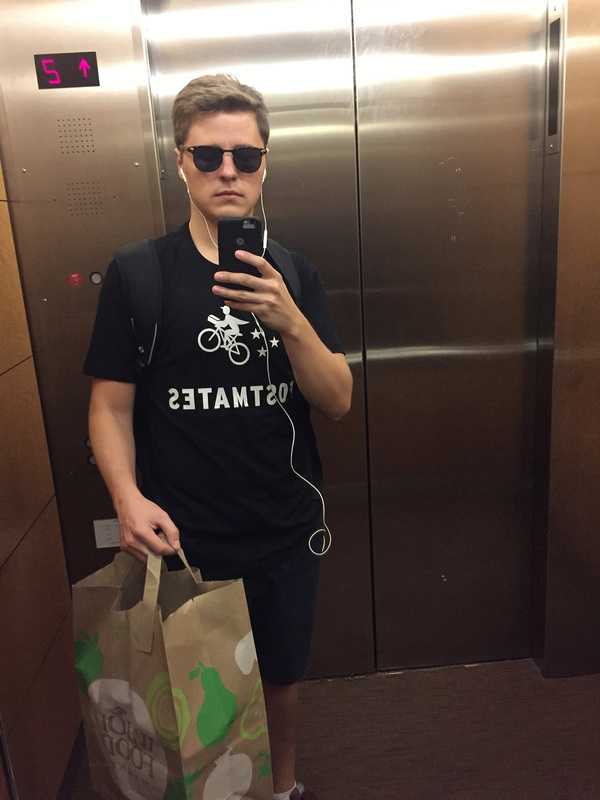 In a move that could be called brilliant or desperate, Yla dressed as a courier for delivery company Postmates and showed up at the offices of companies on his target list—armed with a box of pastries from downtown favorite Mr. Holmes Bakehouse. Inside the boxes were notes with a bit.ly leading to his LinkedIn page and a message addressed to the CEO, CMO and/or marketing vp: "Most resumes end up in trash. Mine—in your belly." To our knowledge, no agency executives tried to eat his CV, but his surprise sweets seem to have made an impression. 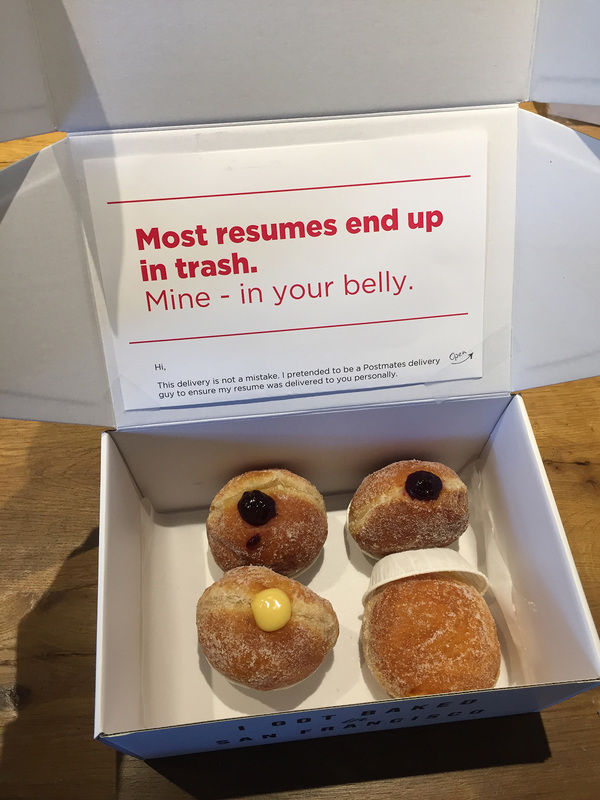 "I delivered donuts to over 10 of the most known agencies in San Francisco, including Mekanism, Teak, Heat, Eleven, Salt Branding, Muh-tay-zik Hof-fer, Grey, AKQA, Venables Bell and Duncan/Channon," he tells AdFreak, adding that he did score interviews at two of the aforementioned shops. Interestingly, Yla says, "I see better outcomes from targeting tech businesses." He also noticed a less personal touch at some of the larger agencies he visisted. "I am not sure if key people at big agencies [such as] AKQA or Grey received my delivery in the end," he says. "I was not allowed to hand deliver personally and had to leave it at the reception desk." His deliveries "might look like a stunt, but like many marketing campaigns, it's just the tip of the iceberg," says Yla. "It was a precisely crafted idea that went through multiple iterations until it finally reached you. I did SWOT analysis by observing the competitive landscape, the main pain points of my target audience, and the message I wanted to deliver. Once I launched the campaign, I performed A/B tests on companies of different sizes, different target audiences and with variations on the copy. I used a special URL to measure the offline outcomes and act on them to maximize ROI of the campaign." He certainly speaks the language, and his project to date has recorded some solid results. "Overall I have delivered a little bit more than 40 packages," he says, "and been in 10 interviews … most of them are still in progress." That 25 percent is nearly 10 times the average direct marketing response rate. But then, sales emails aren't quite as appealing as free donuts. In another sign of Yla's SEO-ready determination, his personal email signature includes a hyperlink to a slideshow titled "7 Marketing Rules for Drug Dealers." The product he has delivered to these companies, however, was anything but illicit.